RSVP strives to offer quality kitchen products and cooking tools at competitive prices. Our 5-Piece Canning Set is the perfect example. Essential canning supplies for preserving your own fruits, jams, pickles and other garden goodies. The funnel prevents spills, keeps jar rims clean and fits both standard and wide-mouth canning jars. The jar lifter lets you safely remove canning jars from boiling water. The magnetic lid lifter easily lifts lids out of simmering water. Tongs are handy for picking up hot items. The jar opener helps open canning jars as well as other screw-on lids. 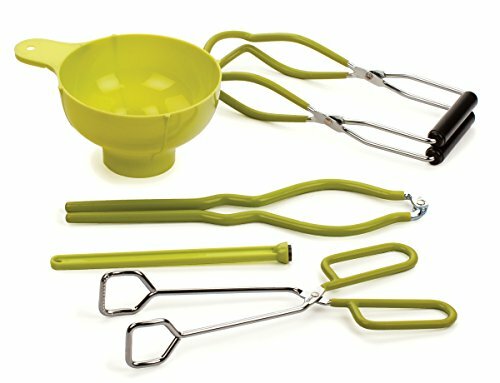 The jar opener, tongs and jar lifter are all coated with PVC to stay cool and help you get a good grip. Funnel is 5-inches in diameter with a 2-inch spout. Magnetic lid lifter is 7-inches in length. All pieces are dishwasher safe. When all the right people, and ingredients, kitchen tools, and food come together, we call this The Art of Gathering.